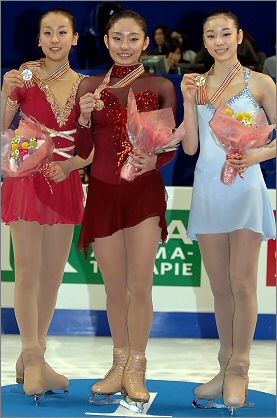 Miki Ando of Japan (middle) won her first World title, while teammate Mao Asada (left) won the silver and Yu-Na Kim of South Korea (right) settled for bronze at the 2007 World Figure Skating Championships. The 2007 ISU World Figure Skating Championships concluded Saturday with the Ladies Free Skate. Following a decision of the 51st Ordinary Congress of the ISU in June 2006, no Qualifying Rounds were held. The top 24 skaters from the short program advanced to the Free Skate. Miki Ando of Japan won her first World title, while teammate Mao Asada rose from fifth to capture the silver. Yu-Na Kim of South Korea slipped from first to third overall to win the bronze. The ISU has mandated that the winner of each event at a championship be interviewed in the Kiss & Cry for the audience in the arena while the medal podium is set up. It also achieves the goal of keeping the people in their seats for the medal ceremony. When the marks came up on the scoreboard and Ando found out she had won, she looked completely dumbfounded for a second and then the tears started to flow and she screamed with joy as she hugged and clasped her coach (Nikolai Morozov). Ando, who was interviewed immediately after she had found out she won, could barely speak she was sobbing so much. The music of Czardas by Monti was the perfect vehicle to display teammate Mao Asada’s delicate skating skills. The Japanese loved this tiny skater and she had the audience completely behind her. The 2006 World Junior silver medalist opened with a widely-anticipated triple Axel which was fully rotated, but she touched down with her free foot, resulting in a confusing mix of GOEs ranging from -1 through +3. Though her triple toe loop (in combination with a double Axel) was downgraded to a double as it wasn’t fully rotated. The Japanese champion went on to complete a nice triple flip-triple loop combination, and with the beat of music speeding up and the audience clapping, performed a light and lyrical straight line footwork sequence followed by a great level 4 combination spin. With roars of approval, Asada completed a double Axel, a triple Lutz, a level 3 spiral sequence, and a triple flip. The 2006-07 Grand Prix Final silver medalist last jump was a triple Lutz-double loop-double loop combination, followed by her final element – a level 4 flying sit spin at which point the crowd was on their feet. Tears flowed as Asada waved and took her bows. The 16-year-old was awarded a whopping new personal best of 133.13 for a first place finish in the long. With a total of 194.45 points, she rose from fifth to second place overall. Teammate Miki Ando was the final skater of the World Championships, and took the ice showing no sign of the nervousness she felt. There were rumors that she might attempt the quad Salchow in her program, but she opted not to take the risk of a similar result to the Torino Olympics where she missed the quad (and many other jumps), resulting in a 15th place finish. Skating to Violin Concerto in E Minor, Op. 64 by F. Mendelssohn, Ando’s superb jumping technique was evident in her opening jumps – a beautiful triple Lutz-triple loop combination followed by a triple Salchow. After landing a triple flip, the Japanese silver medalist produced a flying sit spin with variations in position and a level 4 spiral sequence which showed good edges and extension. Passing the ½ way point in the program Ando then completed the rest of her jumps: a triple Lutz, a triple toe loop-double loop-double loop combination, a triple flip-double loop combination, and a double Axel – all of which received bonus points. As the music picked up, Ando performed a dynamic level 3 straight line step sequence. Both combination spins were graded a level 4 and she closed with a level 2 layback spin. The 19-year-old earned a new personal best of 127.11 points, placing second in the long. With a total score of 195.09, she placed first ahead of Asada by less than 0.65 points to win the gold. USA’s Kimmie Meissner, who stood in fourth after the short, placed third in the long (115.56 points) and fourth overall (180.23 points). Following the ovation given to Asada, Meissner calmed herself at the boards before taking her opening pose. She skated her program to Galicia Flamenco with energy and fine interpretation of the Latin music. Although Meissner landed a very good double Axel, she had to put both her hands and free leg down on her opening triple Lutz. Her second jump of a triple flip-triple toe loop combination was downgraded to a double, however, the 17-year-old had the crowd clapping while she produced a level 3 straight line step sequence which was interpreted with flair. The US Champion went on to complete a triple Salchow, a triple loop, and a double Axel-double toe loop-double loop combination, however her second triple Lutz was two-footed. Meissner’s level 3 spiral sequence showed good edges and flow, and a level 4 combination spin featured a camel position with her arms clasped behind her back and fast sit positions. The Four Continents champion concluded her program with a level 4 combination spin which had great speed. “It was tough tonight,” admitted Meissner. “Mao skated before me and obviously did very well so that the crowd was really into it. It was very emotional and intense. I had to calm down myself, and I think it took me a jump to get into it. Elegance and superior skating skills were brilliantly displayed in Yu-Na Kim’s program to The lark Ascending by Ralph V. Williams. The South Korean landed a beautiful triple flip-triple toe loop combination with wonderful flow as well as a big smile, followed by an equally beautiful double Axel-triple toe loop combination entered from an ‘Ina Bauer’, and a gorgeous level 3 layback spin. The 2006 World Junior champion went on to deliver double Axel, a level 4 camel spin which showed multiple attractive positions, and a light and lyrical straight line footwork sequence which flowed with the music. Kim had a few jump problems though, falling on two triple Lutzes and then executing a triple Salchow-double toe loop combination which received no credit as it was deemed a fourth combination. Despite the mistakes, the overnight leader otherwise produced a level 4 flying sit spin with a huge death drop, a level 3 spiral sequence which showed excellent extension and speed, a double Axel, and level 3 combination spin. The 16-year-old placed fourth in the long (114.19 points), slipping from first to third overall with a total of 186.14 points. After her 16th place in the short program, Joannie Rochette of Canada skated first in the second warm-up group. Determined to finish in at least 12th place overall, and thus retain two ladies spots for next year, Rochette showed maturity and composure in her excellent interpretation of Don Juan by Felix Gray. After opening with a good triple flip-double toe loop-double loop combination, a triple Lutz-double toe loop combination and a triple loop, the Four Continents bronze medalist moved nicely to the flowing music into a combination spin that had good speed and positions. Rochette’s level 3 straight line steps were right on the beat of the music, and she rebounded from a step-out on a triple flip with a good double Axel-triple toe loop sequence. However, the Canadian champion popped her second triple Lutz to a single before completing a triple Salchow. Her final jump was a double Axel and she ended the program with a level 3 combination spin and level 4 flying sit spin. Rochette earned 109.13 points for a fifth place finish in the long, and with a total score of 158.98, catapulted to tenth place overall. Japan’s Yukari Nakano displayed a fighting spirit and went for everything in her program to Cinderella by Prokofiev. The Asian Winter Games champion fell on her opening jump, a triple Axel that appeared rotated but was downgraded to a double. She also completed three jump combinations: a triple Lutz-double toe loop combination, a triple flip-double toe loop combination, and a triple Salchow-double toe loop-double loop combination, as well as a triple flip and a triple Salchow. After a bad landing on a flying sit spin, Nakano showed her strength and determination by staying on one foot during the spin which traveled, and the 21-year-old ended the program with a double Axel which was landed right on the last chord of the music. The Japanese bronze medalist placed sixth in the long (108.30 points), rising from seventh to fifth place overall with a total of 168.92 points. Susanna Poykio of Finland, who stood in tenth after the short program, placed seventh in the long (102.96 points) and eighth overall (160.12 points). The 25-year-old skated with beautiful musicality and interpretation to music from the Munich soundtrack. The program was solid with the exception of a fall on a triple toe loop and a doubled flip in combination with a double toe loop. The Nordics champion, who landed a total of five clean triple jumps, also produced three good level 3 spins, as well as a good level 2 straight line footwork sequence. Switzerland’s Sarah Meier placed eighth in the long (102.28 points) and seventh overall (160.80 points). Skating with gentle speed and flow, the European silver medalist had a good start in her routine to music from the Pride and Prejudice soundtrack, landing a high triple Lutz-double toe loop-double loop combination, but then the 22-year-old doubled a flip in combination with a double toe loop and struggled with the landing of a triple flip. Meier also fell on a triple toe loop, but otherwise produced a good triple Lutz as well as three level 4 spins which were centered and had good position and speed. Carolina Kostner of Italy struggled with her jumps in her routine to Memoirs of a Geisha, placing 9th in the long (101.77 points) and slipping from third to sixth place overall with 168.92 points. The European champion fell on a triple flip, doubled a triple Lutz, stepped out of a double toe loop in combination with a triple flip, and singled a loop in combination with a triple loop. The 20-year-old otherwise produced a clean triple flip, triple Salchow, and double Axel, as well as a level 4 spiral sequence which had good edges and excellent flow. Though Kostner’s total score matched that of Nakano’s (168.92 points), Kostner was ranked sixth because the tie-breaker is the placement in the free program. Teammate Valentina Marchei, who was 23rd at this event last year, finished 11th overall. The 20-year-old, who was clearly happy with her long program to Adios Nonino by Piazzolla, literally skipped across the ice after taking her bows. Kiira Korpi of Finland placed 11th in the long, rising from 17th after the short, to 14th overall. USA’s Alissa Czisny, who stood in 18th after the short, placed 12th in the long and 15th overall, while teammate Emily Hughes finished 13th in the long and ninth overall (159.06 points). Elena Sokolova of Russia finished 13th overall after placing 14th in the long program. Hungary’s Julia Sebestyen slipped from eighth to 12th place overall after finishing 15th in the long program. Russia’s Arina Martinova was 16th, followed by Elene Gedevanishvili of Georgia.